CAMBRIDGE – The American Repertory Theatre is not against welcoming shows created by other theater companies of merit. The Oregon Shakespeare Festival and Director Bill Rauch commissioned and premiered the play “All The Way” in 2012 and brought the play to the ART in 2013, where it starred Bryan Cranston as Lyndon Baines Johnson before going on to Broadway, where it won Tonys for Best Play and Best Actor. Rauch also brought “Fingersmith” to the ART in 2016, and he won Best Director honors from the Independent Reviewers of New England for both productions. The OSF production of Shakespeare’s tragedy “Othello” has landed at the ART and Rauch has tweaked and updated Shakespeare’s 400-year-old masterwork, with an eye towards emphasizing Othello’s status as an immigrant and outsider, who is kept at arm’s length in his adopted homeland even as he risks his life for its security. Here Othello (Chris Butler) is an admiral serving on a contemporary American naval base, honored for his accomplishments but still arousing concern and suspicion; he is black, after all, a convert to Christianity, and despite his successes not part of the inner circle. Butler’s Othello also employs a very distinct accent that sets him apart from his fellow soldiers and countrymen and accentuates his status as an outsider. Often, he is not even deemed worthy of being addressed by his given name, with “Moor” the preferred alternative. Race is very much a factor – as it always is – from the moment Othello, in the flush of military triumphs, weds the beautiful Desdemona (Alejandra Escalante ) daughter of the powerful senator Brabantio (Richard Howard), who in a fit of anger and rage accuses Othello of sorcery and bewitching his daughter, whipping up more animus against Othello in the process. Iago (Danforth Collins) is Othello’s ensign, is awash in two powerful emotions: jealousy at Othello’s success and anger at being passed over for promotion in favor of Cassio (Derek Garza), Othello’s loyal lieutenant. He thirsts for revenge at the snub and tries to position himself to be in the right place should Othello crumble. Collins is more physically imposing than many others who have played the part, who have often tended to be stealthy types, often paling and cowering before Othello’s strength and power. Iago is a master manipulator, taking advantage of Othello’s resentment at his treatment to foster doubt in his mind about the loyalty of both Cassio and Desdemona. He stokes the fires of jealousy in Othello, turning mere kindling into what will become a raging fire. Iago also engages the shiftless Roderigo (Stephen Michael Spencer ), who dreams of Desdemona and is eager to be part of any of Iago’s schemes that might lead to a break between her and Othello. This “Othello” is anchored by the strength of its female roles; Alejandra Escalante as Desdemona is a loving, devoted and loyal wife, all of which is not enough to allow her to escape her deadly fate; an excellent Amy Kim Waschke is Emilia, in this version not only a naval officer but a friend and lady in waiting to Desdemona who unwittingly becomes part of husband Iago’s deadly scheme. Rainbow Dickerson is a saucy, sassy Biana, herself the victim of abuse at the hands of Cassio. 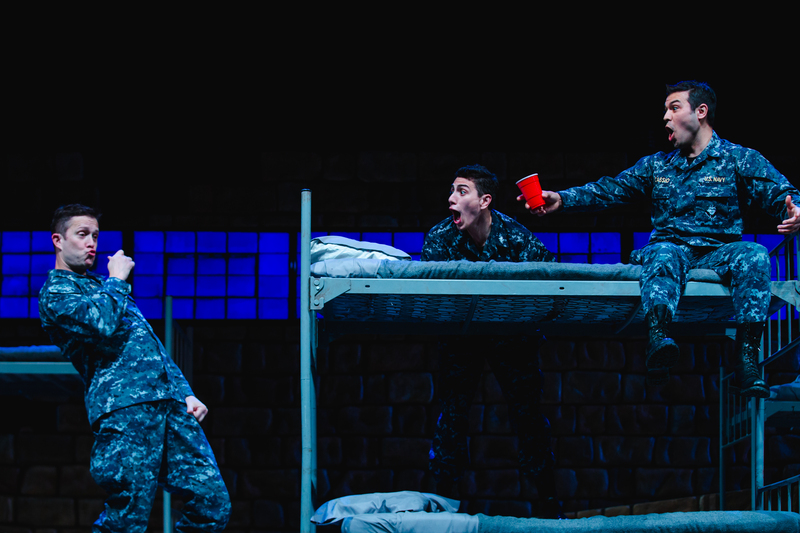 In recent years, some local troupes that have staged “Othello” have trimmed back its length a bit, but theater-goers shouldn’t be put off by its three-hour length (with an additional 15-minute intermission). 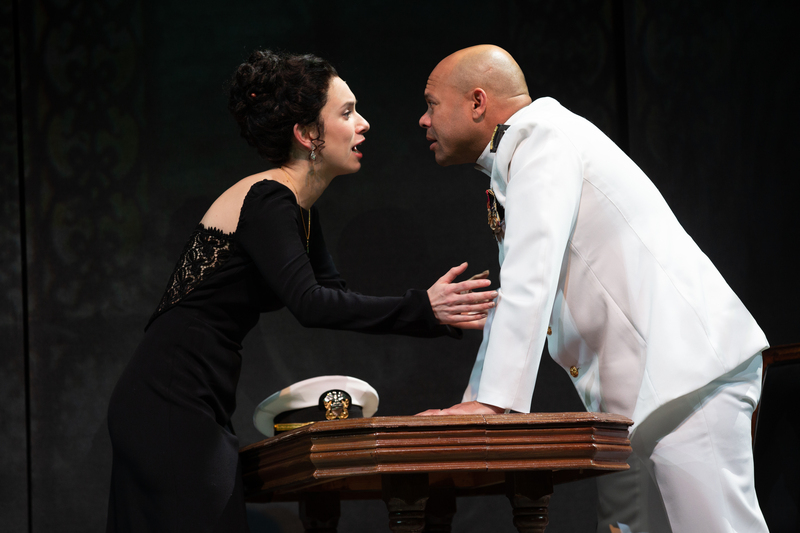 In the hands of Rauch and his stellar cast, this “Othello” is an example of what can happen when all of a production’s disparate elements – acting, direction and production values – are at their best. Set designer Christopher Acebo and composer/sound designer Andre J. Pluess were both part of the troupe’s earlier successes at ART and their work is again integral to fostering the just the right atmosphere for the production. In the way he has staged the play, Rauch, who is leaving Oregon to become artistic director of the new Ronald O. Perelman Center at the World Trade Center in New York City, is making a statement about our times. In his view, 400 years later, things haven’t changed all that much for outsiders – or immigrants — such as Othello. The American Repertory Theater presents the Oregon Shakespeare Festival production of “Othello.” Written by William Shakespeare. Directed by Bill Rauch. At the Loeb Drama Center through Feb. 9. americanrepertorytheater.com.